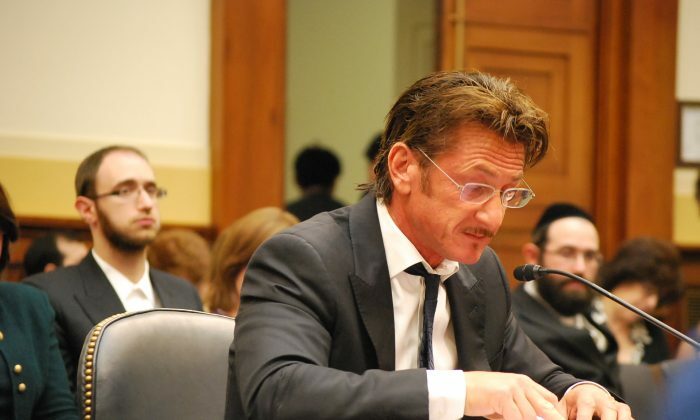 Actor Sean Penn asked legislators to intervene for American Joseph Ostreicher, who has been held in Bolivia for nearly two years. Penn testified before the congressional committee on Subcommittee on Africa, Global Health, Global Human Rights and International Organizations on May 21. He asked them to convince the Bolivian judiciary to release Ostreicher, a Brooklyn businessman. Ostreicher, who developed signs of Parkinson’s disease while in Palmasola prison, has been fighting the Bolivian judicial system over charges of investing misappropriated funds in his Bolivian based rice growing business. According to Penn, Bolivian President Evo Morales is powerless to intervene against a corrupt judiciary, which is essentially holding Ostreicher hostage using trumped up charges. “In solidarity with the President Morales and the Bolivian people, that I request that all of the distinguished members of this committee use every peaceful means necessary to persuade the Bolivian judiciary to finally release Mr. Ostreicher to return to the United States and to this family,” said Penn. Penn also recommended that Congress ask the sponsors of the Dakar Rally, an international off road race, to put pressure on the Bolivian judiciary to release Ostreicher. The race is planned to take place in South America in 2014. He wants the race to avoid Bolivia. Penn described scenes from his visits to Bolivia in 2012. He met with Morales multiple times. Morales showed signs of “personal and human grief” for having been left with a judiciary populated by members of a well known criminal network known in Bolivia as “la red,” according to Penn’s testimony. Congressman Chris Smith (R-N.J.), chair of the Subcommittee on Africa, Global Health, Global Human Rights and International Organizations and Congresswoman Nydia Velazquez (D-NY) visited Ostreicher in June 2012. Ostreicher is on house arrest in Santa Cruz where he has received threats to his life and wears a bulletproof vest according to Smith. “Immediately following meetings that I had with Bolivian officials in La Paz last June, including Carlos Romero, Minister of Government, Bolivia started to investigate whether Mr. Ostreicher was the victim of extortion. A total of 27 prosecutors, judges, and officials responsible for confiscated goods who were involved in Mr. Ostreicher’s case have now had charges made against them. Currently, 13 of them are in the Palmasola prison, nine are under house arrest, and five are fugitives,” said Smith at the hearing. Ostreicher invested in a Bolivian rice farm. It was productive, during a time when the country suffered a rice shortage and a ban on rice exports. The judiciary seized all the rice farm assets including 50 million pounds of rice, worth $18 million, according to June 2012 congressional testimony from Ostreicher’s wife, Mirium Ungar. Smith and Velazquez have reintroduced Jacob’s Law of 2013, HR 1778. It requires foreign services officials to be trained not to issue visas to foreign government officials or their families, if the officials deprived Americans of due process or human rights. “It is wrong for our government to give foreign officials and their families the privilege – and it is a privilege, not a right – to visit and study in the U.S. while those same officials are wrongfully detaining an American abroad,” said Smith.